DESCRIPTION This is a beautiful example of a Three Bedroomed Semi-Detached Period Cottage, positioned in this picturesque village of Tealby, which is positioned within the Wolds in Lincolnshire. The property has internal accommodation to comprise of; Entrance Hallway, Utility Room, Lounge, steps down to Sitting Room, Dining Room, Ground Floor Bathroom, Kitchen, First Floor Landing leading to Three Bedrooms and Separate WC/Cloakroom. Outside, there is a driveway to the front, providing generous parking for vehicles and leading to the rear of the property. There is also a summer house, sheds, extensive cottage-style planted gardens to the side and rear, greenhouse and outbuildings. Viewing of the property is highly recommended to appreciate the accommodation and the position it sits in this popular, picturesque village of Tealby. ENTRANCE HALL 6′ 0" x 9′ 10" (1.83m x 3m) With window to the front, uPVC door to the front, radiator, fitted cupboards and doors to the Utility Room and Lounge. UTILITY ROOM 4′ 11" x 9′ 9" (1.5m x 2.97m) With uPVC window to the side, space for fridge and freezer. LOUNGE 16′ 0" x 15′ 11" (4.88m x 4.85m) With sliding doors and windows to the front, two uPVC feature bay windows to the side, beams to the ceiling, steps down to the Sitting Room and radiator. 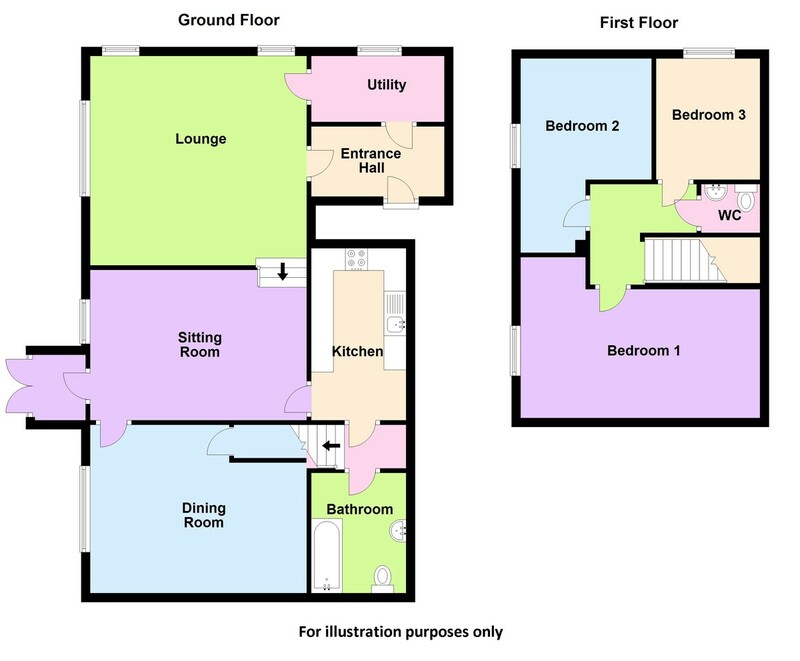 SITTING ROOM 14′ 2" x 11′ 1" (4.32m x 3.38m) With windows and doors to the rear, decorative fireplace, door to the Dining Room and Lounge, fitted storage cupboards and radiator. DINING ROOM 14′ 6" x 12′ 5" (4.42m x 3.78m) With window to the rear, under-stairs storage cupboard, decorative fireplace and radiator. KITCHEN 13′ 6" x 7′ 0" (4.11m x 2.13m) With double glazed window to the front, fitted with base units and drawers with work surfaces over, sink and drainer with mixer tap above, space for cooker, fridge and washer. Wall mounted units with complementary tiling below and door to the Dining Room. BATHROOM 9′ 6" x 4′ 7" (2.9m x 1.4m) With window to the front, suite to comprise of; walk-in bath with shower over, WC, wash hand basin, chrome towel radiator and partly-tiled walls. WC 4′ 4" x 4′ 1" (1.32m x 1.24m) With WC, wash hand basin, airing cupboard housing gas central heating boiler and partly-tiled walls. BEDROOM 1 15′ 1" x 9′ 5" (4.6m x 2.87m) With window to the rear, radiator and fitted wardrobes. BEDROOM 2 11′ 1" x 8′ 8" (3.38m x 2.64m) With window to the rear, radiator and fitted wardrobes. BEDROOM 3 10′ 4" x 9′ 3" (3.15m x 2.82m) With window to the side and radiator. OUTSIDE To the front of the property, there is a gated driveway providing generous parking facilities. To the rear of the property, there is a paved seating area with mature well-stocked cottage-style planted gardens, secluded greenhouse and brick built store with WC and shed. To the side, there is an extensive lawned garden with flowerbeds, mature shrubs and trees, summer house, shed and hard-standing for further vehicular parking.